There are certain artists who create art we find ourselves turning to again and again throughout our lives. There is no author or songwriter who doesn't have certain themes that define their work. When we find someone whose creative expressions resonate with us, we often feel we've found a friend who has peeked into our souls and given us a gift...even if we never lay eyes on them. There is no one like this for me quite like Andrew Peterson. From the moment I first discovered his music I have followed with great interest what he does. He writes beautiful music, fun books, and stirring essays on his collaborative blog, The Rabbit Room. And in everything he shares with the world, we find the same themes layered within, the same characteristics displayed. Faith that gives us a rich heritage, wonder in the ordinary, a longing for home, the audacity to live with hope, the treasure of family. His words and music communicate with something deep within me that cries out to know, that yes, there is more. My anticipation for Counting Stars, Peterson's newest album, was high as it is with every new release. I have not been disappointed. Not at all. The more I have listened to this new collection of music, the more I've been moved and the more I love it. "The Magic Hour" is another stunning song about the beauty and mystery to be found right at home. It's the kind of song I can listen to a million times in a row, it's just so achingly beautiful. From a lyrics standpoint, "World Traveler" excels and I found this part so romantic! I want to travel the world." My favorite song is probably "The Last Frontier" which is labeled a lament in the CD booklet. And it surely is, but it's one that ends with the hope that sustains those of us who believe. I have not been able to listen to this song without getting all misty eyed, and then wrapping up the album with "The Reckoning" is pitch perfect. 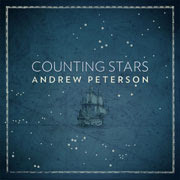 Andrew Peterson has given us another gift of music that is deeply personal and yet universal, another collection of songs that tell us a story--the story of the beautiful bright mystery of life and love and faith. If you appreciate thoughtful faith driven music I just can't recommend Andrew Peterson enough. Please go buy the CD today!